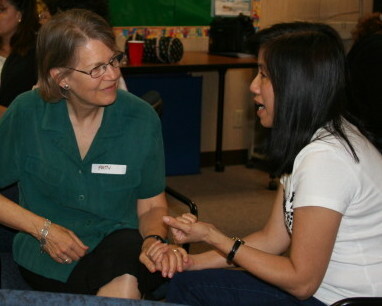 Listening Partnerships are where we listen in turn with another adult, swapping an agreed amount of listening time. You can use Listening Partnerships to work regularly on the pressures and tensions of parenting and family life. And you can use them as an “emergency relief valve” – finding someone to swap a short (or longer) amount of listening time when you are upset, or need a chance to think through a challenge. This kind of time can make a huge difference, turning a bad day into one that is productive. Staying close, building and maintaining connection, and setting warm. loving limits when necessary, is hard work. Working with parents from all walks of life, we have found that organising this kind of support for ourselves is important to continuing to be able to offer our children the warmth, loving and connection that they need. Used over time, it will build the creativity and flexibility with which we respond to our children, and our parenting challenges. Your job is to to assist your partner to tell their story, not “make friends” or get information, or tell your own story or give helpful hints. – share the time, and make sure you take turns. Everyone needs a chance to tell their story. Some people like to talk a lot, and others may feel like they have nothing to say, but with good listening, every person who cares for children will find something they want to talk about. Don’t shorten the time: it may feel uncomfortable at first, but over time we learn to use this listening time (just like children will learn to use the Listening Tools we offer them). If you can’t think of anything else to say, tell your life story! As we do this kind of listening more regularly, we start to notice more things we want to talk about. Taking a turn to listen well to others will also give us new perspectives on our own stories and experiences. Listen with respect, warmth and interest. Don’t interrupt. Don’t give advice. Trust that just listening is enough. Your listening will allow your partner to talk things through and to sort and learn from their own experience. When they listen to you, they will do the same for you. Strict confidentiality makes it safe for everyone to talk about anything they need to. Don’t refer to anything anyone said while in a Listening Partnership – not in conversation with them afterward, not in your own turn being listened to, or to anyone else later. Knowing that our story will stay “inside the listening time” makes it safe to eventually say things which feel embarrassing or could be criticized, or talk about things we are not sure about. We all need a safe place to talk about these things.